Photo by Ken Schwarz. Licensed via Creative Commons. Yesterday, I proposed a new immigration visa; I'm proposing yet another one today (my fifth). It's called the "honorary visa." 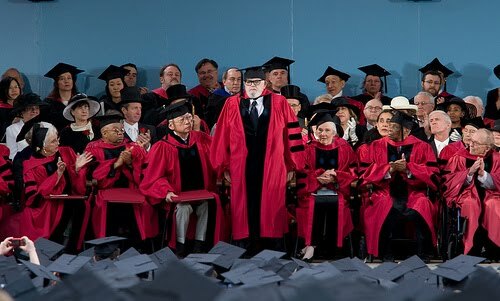 An honorary degree is an academic degree for which a university has waived the usual requirements, such as matriculation, residence, study, and the passing of examinations. 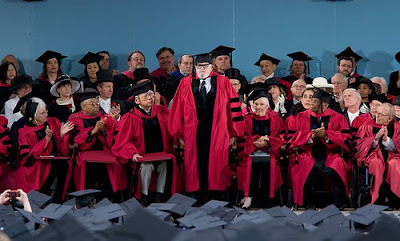 The degree is typically a doctorate or, less commonly, a master's degree, and may be awarded to someone who has no prior connection with the academic institution. Usually the degree is conferred as a way of honoring a distinguished visitor's contributions to a specific field, or to society in general. The university often derives benefits by association with the person in question, and the recipient may (contrary to popular opinion) receive the full benefit and privilege of the titled degree. You see where I am going with this: there are people in the U.S. who by their conduct have demonstrated themselves worthy of the American name, even though they have not followed along with the crowd of people who have gone through the processes typically required to carry that title. Congress could create an "honorary visa" to recognize these achievements and contributions, because we currently have nothing like this for applicants already in the United States. Government, famous for inefficiency, could take advantage of 20/20 hindsight and grant this visa to the people we would have wanted to admit in the first place but didn't. I call this new process the "honorary visa," and I can't wait to see the first ceremony. Some text about honorary degrees licensed from Wikipedia.